Sevilla vs Bayern was a fascinating affair with the Spaniards taking the lead but then being overwhelmed by an efficient Bavarian machine. Bayern with a comeback victory. Sevilla beaten for the first time at home by a German side. Bayern with two crucial away goals. It was a cultured start to proceedings at the Ramón Sánchez Pizjuán Stadium with both teams playing putting up a passing and pressing school that neutralised either side in the early goings. At that early stage, Sevilla appeared to be the more dangerous of the two sides making several attacking runs without being able to crack Bayern’s backline. In the 20th minute, Sevilla should have taken the lead. A deep cross by Steven N’Zonzi was poorly cleared by Jérôme Boateng and the ball fell right to Pablo Sarabia, who had a wide-open net in front of him but curled the ball past the outstretched Sven Ulreich and the goal.Bayern had 60% possession, but Sevilla took the lead with Sergio Escudero playing a deep cross inside the box where Sarabia beat Juan Bernat to the ball and then beat Ulreich with a close-range shot. Replays showed that Sarabia had used his hand to control the ball, but the goal stood. Shortly after Arturo Vidal had to come off with an injury and was replaced by James – perhaps it was the change the Bavarians needed because in the 37th minute Bayern had equalised with Ribéry finding space on the left wing playing a sharp ball in the centre where Jesus Navas deflected the ball into his net. Overall, the first half was an excellent display by two sides willing to play wide open attacking football. Bayern were the more aware of the two sides coming out of the dressing rooms, and in the 48th minute, Sevilla created the first chane of the second half. Wissam Ben Yedder found himself with plenty of space inside Bayern’s box playing the ball to the centre, but Javi Martínez had raced back and cleared the situation ahead of Sabaria with a fantastic sliding tackle. Midway through the second half, Bayern slowed the game down significantly by keeping possession and playing the ball forward in a controlled fashion. As a result, Sevilla were no longer able to take the game to the Bavarians, who in turn were testing and probing Sevilla’s backline. One of those probes were almost successful in the 66th minute with Bayern gaining control of the ball in their half and quickly playing forward Müller found Javi Martínez unmarked in the box, but his volley was fantastically stopped by Sevilla keeper Soria. In the 68th minute later Bayern had the lead. Ribéry’s deep cross found Thiago, who headed the ball towards the net and thanks to a small deflection by Escudero managed to beat Soria to give Bayern the lead – the goal was given to Thiago but could have very well been noted down as an own goal. 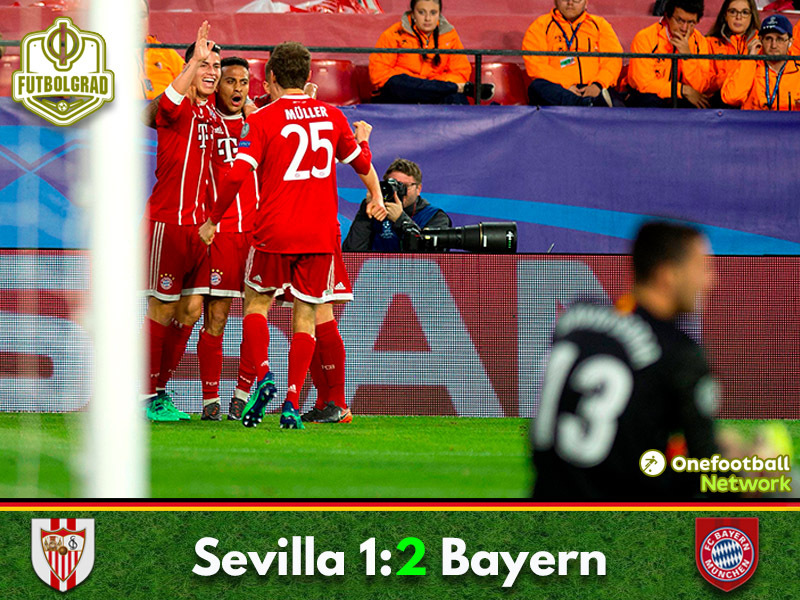 Sevilla almost seemed to switch off after the second Bayern goal but where lucky that the Germans did not punish their sluggish play. As a result, the game remained open going into the final ten minutes with Sevilla holding most of the possession without finding a way through Bayern’s backline, which did a fantastic job shutting the game down. Starting for James Rodríguez, who was excellent against Dortmund on Saturday, Thiago was the man of the match. The 26-year-old midfielder was exactly the medicine Bayern needed against Sevilla. Controlling the midfield like a metronome Thiago played 56 accurate passes managing to get 91.8% of his passes to the man. He also created Bayern’s second goal with a header, and it will be interesting to see whether UEFA will award the goal to the Spaniard or count it as an own goal. Sevilla took the lead and had Bayern on the robes. But Arturo Vidal’s injury in the first half forced Bayern head coach to bring on James in the first half. 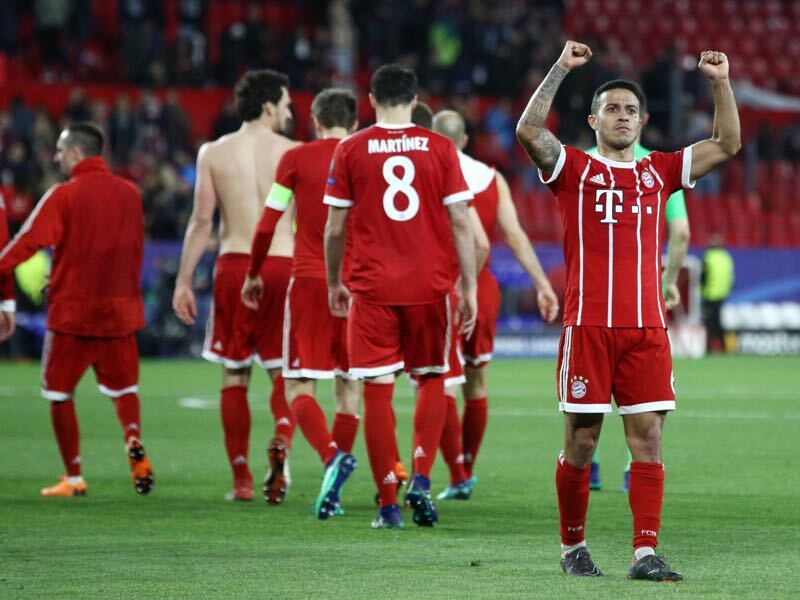 The Colombian brought control to Bayern’s midfield, and in the end, the Rekordmeister overwhelmed Sevilla and walked away with a deserved 2-1 victory. Jupp Heynckes becomes the first coach in Champions League history to win 12 games in a row. Thiago scored seven of his eight champions league goals in the knockout stage. For the first time in the Montella era Sevilla lose after taking the lead.